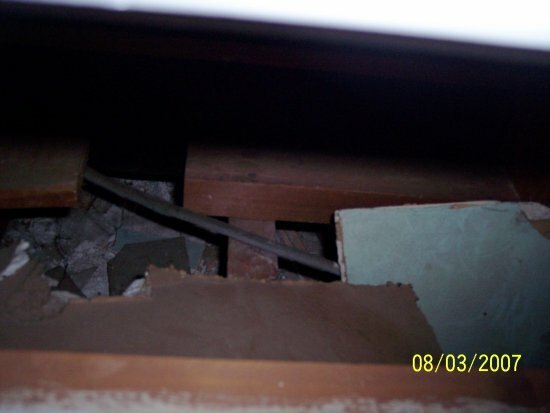 Just when is it necessary to protect NM in an attic, say, by the use of running boards? Do you think this run needs protection? Last edited by renosteinke; 08/06/07 08:56 PM. Where is this in relation to the attic access opening? Well, the only way to get into this soffit/attic is through the garage attic. From here to the garage attic hatch is about 30 feet. From this cable to the opening between the two is about 15 feet. This cable is actually underneath a set of built-in dresser drawers, so it's not accessible at all. HOWEVER, we were told by the previous owners at closing that there used to be an access hatch before the handyman built these drawers in. So, now, protection probably isn't needed, 50 years ago, maybe. I'm a bit mixed on this one, on one hand I don't consider romex in your average attic exposed to physical damage, due to the scarsity of traffic, however if there's potential for making the attic a storage space, i.e. throwing down some plywood and storage bins, this goes from a non-issue to an efficient fire-starter once the ply rubs through the insulation.